For years, my C7 vertebrae has made a strange noise when I turn my head. For about three weeks now, I’ve been having odd tinglenumbness (said she, queen of the neologisms) at the tip of my middle finger. Now, for the past two days, I have a new symptom: a pain that stretches along my left triceps. I haven’t seen that muscle in years, but it’s still under there. I know, I can feel it. You know when you go in to a medical service provider and they ask you to describe the pain? I can only describe this as rubbery. And, it reminds me of funny-bone pain. I think I finally sproinged the C7 nerve. (edited to add: I succumbed and took medication for the pain, and overslept this a.m., missing EFM as a result. This morning, I woke up early to work on an article for the magazine I edit. It’s one of those 2,000 word pieces that just makes you want to rip your hair out. So I got up at 6 and transcribed one last interview to add to the story. No biggie. But it’s highly unusual for me to be up that early, to say nothing of up before my darling future husband. Now bear in mind I’ve been calling him that for two years, and had even got as far as setting a date last summer for, oh, six weeks from now. But it didn’t pan out, and so I remained quasi, semi, unofficially engaged (QSUE). There’s been all this talk in the house about a ring his grandfather gave him, but somehow it had gotten misplaced. The joke was that Grandfather was telling DFH that it wasn’t time yet, and when it was time, he’d let DFH know. So I’ve been QSUE for quite some time. Special events came and went without so much as a hint of a breath of a possible proposal. Talk about marriage? Sure. But proposal? Nah. Not unless it was me ribbing him. In the past month or so, DFH has been very agreeable to getting married–as long as it’s after 7 p.m. And, of course, there’s the house, which has continued apace; we’re still on track to close on April 26. Lots of good things going on, buoying us. Things like finding out the neighbors–in that antebellum estate house that preserves our spectacular view–also go to the Episcopal church in town, which has also recently started an EFM program. I might finally have a church home within walking distance. So this morning, as the sun was coming up, I noted wryly that I was the one to wake DFH up–usually he wakes me up. There’s a weird energy afoot lately, one that’s carrying us through this home purchase and through some trying times with work and family. It’s positive. And, I note, it’s almost spring, as I’m jumping onto the bed with his usual refrain of, “Up, up, baby!” He’s muttering; I’m laughing. Everything is backwards. He gets up, and, as often is the case before he wakes up fully, starts colliding with things. He usually curses at the offending thing-in-the-way and moves on–we’re a bit cramped here in the Medford Pit. But this time, he managed to upset a basket we have hanging from the ceiling and dump all its contents onto his head and the bed below, like a pinata burst at a party. He tilts out the contents, as he calls it, a crow’s cache of shiny things rattling into his palm. He holds up a glittering gold thing, tipped in light, and says, presenting it to me, just as I realize that we have secured DFH’s late grandfather’s blessing from beyond–smacking him upside the head with it, as it were. I fall over full of kisses, saying, I think, yes, yes, yes. They’ve exercised the kickout, which means we are the primary contract holder! Not that I wish ill on the person who originally was going to buy the house, mind you. As it turns out, he’s not ready to sell his own house. All parties signed the contract on as of Friday, 3/9. I filled out my mortgage paperwork today. As I understand it, they had a 4-day kickout, so I should become the primary contractholder tomorrow, when I return the paperwork. Then we go through the nailbiting of the approval of the loan I’ve technically already been approved for, but i won’t believe it until the money’s there. At the same time, we line up a house inspector. And if nothing falls through on those phases, we’ll advance to a closing date of April 26. Sorry for the no faithspaces this week. Think it’s proving to be an every other weekend thing after all. Behold, the power of prayer. (since we can’t afford a full-time residence, we’re buying a part-time one). It also happened to be the same weekend the market heated up in that area. As a result, several of the houses we were considering went under contract, including the one we had most hoped for. However, we still had a chance at the house we liked most. Only problem was that we needed to make an offer this weekend. A backup offer, because the other contract has both contingencies and a kickout. We were very nervous about making an offer because the only financing I had preapproval on was a mortgage product I was not willing to accept. But, I had a new mortgage loan officer working on finding us other financing. A special program for low-to-moderate income families was looking attractive, but our income exceeded the programs limits by a mere $350/year. I joked that I could either go ask my boss for a negative raise or kick DFH off the mortgage. After all, we’re not married, and we postponed the wedding indefinitely, so I have no idea when we even will get married. Had we gone with our original plan, we’d be getting married on May 5, and postponing it back in the fall kind of upset me. But now, it seems to make sense. God still wants me to know that I can walk on my own, and that God will never let me fall again. You see, even the mortgage loan officer and her underwriting team were amazed, because the mortgage payment came out to 45% of my gross income, but I was approved even though I didn’t prequalify. And I can only thank God, and whatever boost of energy that came from the warm wishes of my united EFM circle. Even if they didn’t verbalize it, because I don’t know what was said, hearts were lifted. You know, we found another house we like almost as much, too. So if we can’t get the house we love, there’s another to fall in love with. So even though I know the process will be frustrating, and it’s not in Hogwarts OR closer to my son, I think we’re on the right path. And to top it all off, my son opened up to me tonight. Completely unlooked for, after several months of strain. So, again, God, thank You for answering my prayers. 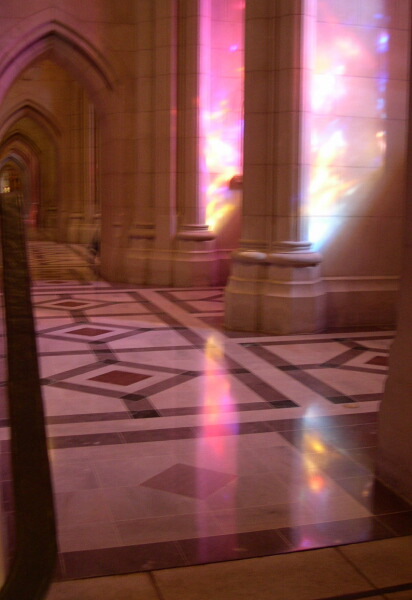 Another in the stained glass series: The light cast by stained glass windows in the National Cathedral leaves the illusion of robed figures–one standing, one kneeling—on the marble floor. I wish the picture itself wasn’t marred by camera movement, but it’s still startling—and lovely.